Nothing tastes better than Victory Beer. This is the beverage you get to consume after you solve a particularly difficult problem on your Land Rover. The beverage is most often one from the British Isles but not necessarily so. See also “victory rum and coke”. We get proclaim victory and drink beer because we solved the mystery of the electrical gremlin that had invaded the Big White Bus. As you may, or may not recall, I had some trouble with the sun roof, clock, driver’s seat, map lights on the rear view mirror, and the interior and door lights. Originally I had planned to have the amazing JagGuy help me sort out the problem. He is a genius and pretty much my go to guy for electrical problems of all kinds that don’t involve attempting to electrocute giant monsters. I usually call The Evil German Dude for that kind of power. Well JagGuy’s grand children were in town and visiting and his lovely wife was celebrating her birthday, therefore No Garage Day routine for him, and incidentally me as well. So after I drove to the shop in Oklahoma City I turned around and headed back south. Spontaneously I decided to stop by my friend Butch (formerly known as Titanium Hitch)’s house. He was just a few blocks from the complete devastation in Moore, Oklahoma of the May 20th tornado you saw in yesterday’s Newcastle Police Dash Cam post. Southwest 134th street leads straight to his house and was the path of the EF5 tornado. The destruction was hard to drive past. So many lives changed. You can see how the people of England and Germany during World War II felt when their homes were destroyed. 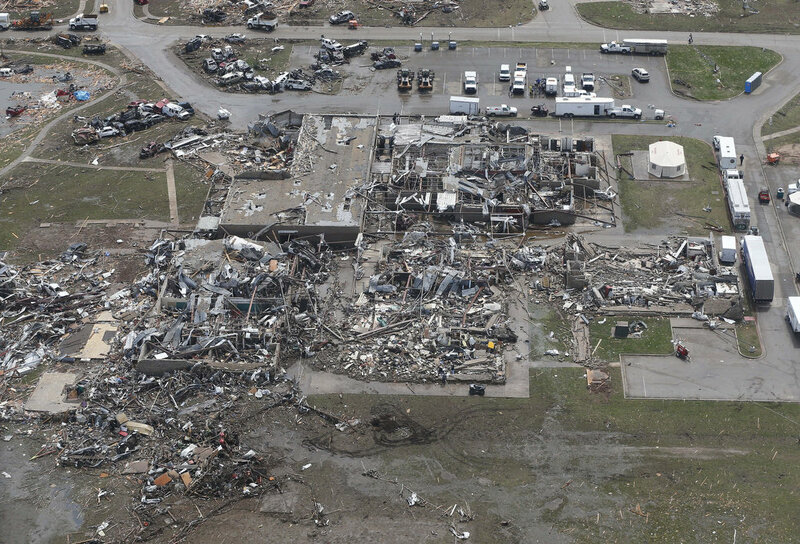 An aerial of the destruction at Briarwood and more after the jump…. He was home and talking to the insurance adjuster about his roof. He had 150mph winds at his house and the roof is trashed. His home was in the “debris ball” of that tornado and the dirt and insulation from hundreds of homes was on everything in his neighborhood. I talked with his wife about her feelings during the event. Their son was in Briarwood Elementary School when the tornado hit. I visited with he and one of his high school buddies who is a roofing contractor. After a great chat, they headed off to lunch and I headed to the Okierover de hacienda. I started by looking at the fuse block. With a suggestion by JagGuy to measure the voltage at the fuse block I found nothing there. He suggested jumpering the fuse next door to the bad fuse port. B5 had no voltage, B4 had the correct amount. I made a jumper out of a paper clip and tested the electrical bits. Sure enough it worked with a jumper. So with that bit of knowledge I decided to look at the wiring loom. I started at the battery and traced the loom back to the fuse block. The wiring loom runs from the battery through a cable to an odd octopus of connections to the fuse block along the right (passenger) fender and on into the cab and to the fuse block. If anything had failed I figured it was outside the cab. Mostly I figured that because I was too lazy to pull the dash off and walk the loom from the fuse block back to the battery. Laziness, what a comfort. A lovely color or green. I tested the solution by jumpering the two wires with a make shift jumper with a fuse in line, as JagGuy said, “just in case.” I was very surprised at how easy this was. I was also pleased to see the circuit light the map light on the bottom of the rear view mirror, signaling my success. I wonder why I continue to use this camera. Blurry. I buttoned everything back up and declared V-WL day. (Victroy Wire-Loom). I bought a round of beers for all those present in my garage. I was sadly all alone but I thanked myself for the drink and went to my office to type up this blog post. I am on my second Victory Beer and this blog post is done. P.S. Some random thoughts. The whole octopus connected to the bolt/connector is, well…poorly done. I would have much preferred a lovely power block with power on one side and the individual wires on the other…and as we are say what we REALLY preferred, those wires labeled with their destinations. Eh, whatever. With every turn of the wrench solder of wire we get closer to the Circumnavigation of Oklahoma. The face of patience as Mrs. Okierover snaps pictures. This entry was posted in EGD, electrical problems, gremlins, JagGuy, Mrs. OkieRover, Range Rover Classic, Titanium Hitch. Bookmark the permalink.